Donald Rumsfeld is sitting in his downtown Washington, D.C., office, reached via an unmarked door, pondering his proximity to the Kardashians and Kate Upton. All three, you see, are currently sitting on Apple’s top app-download charts, the Kardashians by virtue of their lifestyle apps, Upton as spokesmodel for Game of War, and the 83-year-old former Defense secretary for his newly released game, Churchill Solitaire. I am not sure that fun is quite the right word to describe it, though addictive might be. The game is Solitaire for lunatics, sadists, and obsessives. It is played with two decks feeding ten rows, rather than one deck feeding seven. Six of the 104 cards are withheld, and must be cleared directly to the “foundation piles” in the order they are drawn. Some hands are simply unwinnable. The game’s original brainchild was none other than Churchill himself, or at least so the legend goes. Knowledge of it crossed the pond via a Belgian diplomat named André de Staercke, who taught it to Rumsfeld when he was serving as the ambassador to the North Atlantic Treaty Organization during the Nixon administration. De Staercke “could sit across from me on an airplane and tell me what I wasn’t seeing” on the card table, Rumsfeld said, reminiscing about his gaming mentor. 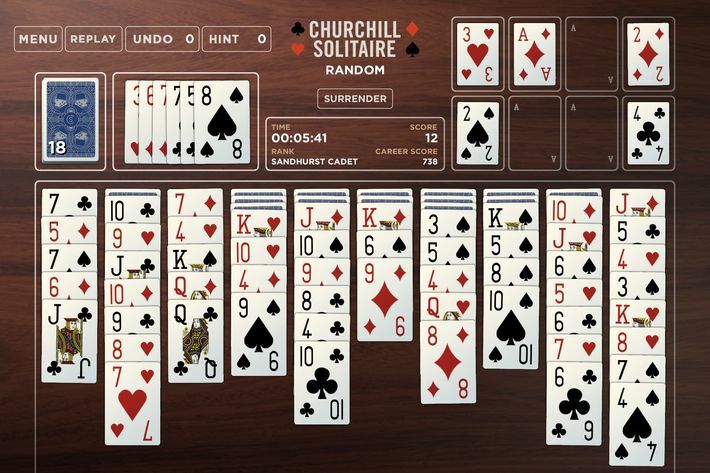 Over the years, through his jobs in multiple administrations, Rumsfeld would play the prime minister’s Solitaire with two decks of mini-cards whenever he had a quiet moment, often with a baseball or football game on in the background. “If you’re on a train or an airplane and you’re footloose and not having meetings,” it is good for keeping you engaged and relaxed, he said. “I love it because it is complicated and it’s strategic,” he said. “You really have to think ahead a number of steps. And it’s competitive.” Or at least it is for him: It is a solitary pursuit, but he has a long-running rivalry with his wife, Joyce. “Don’t write this, but at the moment, I’m ahead,” he said, chuckling. With that, and with far more energy than most 83-year-olds summon, we toured his office, filled with assistants, cubicles, the gentle sound of typing, and enough objets de guerre to fill a military museum. A small sample: a scrap of American Airlines Flight 77, which hit the Pentagon on September 11. Official papers signed by presidents George W. Bush, Richard Nixon, Gerald Ford, and Ronald Reagan. A piece of the Oval Office floor. A photograph of Adolph Hitler’s rocketeer, Wernher von Braun, signed to Rumsfeld “with esteem and affection.” A photo of the moment when Squeaky Fromme tried to assassinate Ford, with Rumsfeld standing right by him. In Rumsfeld’s cubicle sat a shell from the 21-gun salute at Ford’s burial. “Betty Ford gave that to me,” he said before grabbing the Dictaphone, which he keeps on a lectern he uses as a standing desk. “How old is this thing?” I asked, looking at the mini-cassette contraption. 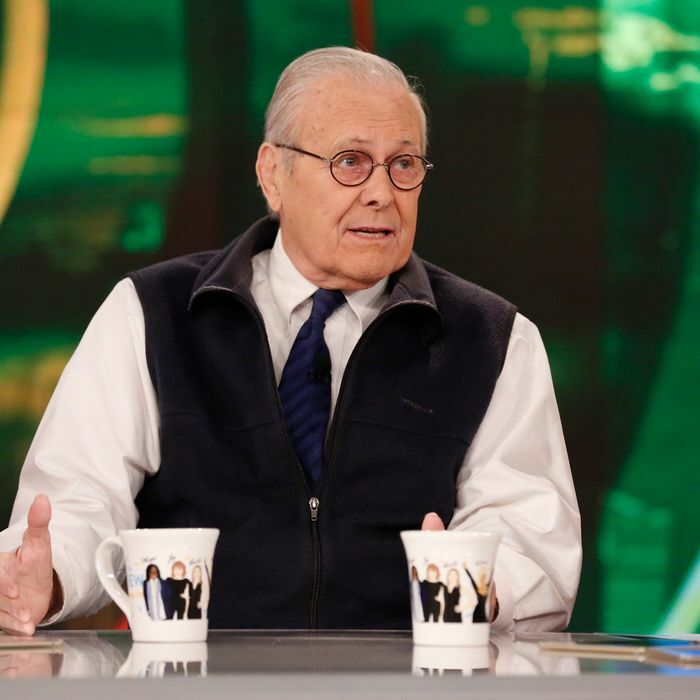 “Not as old as I am!” Rumsfeld hooted. This week, he is reveling in his Kardashian moment, doing a blitz of media and seemingly loving it — Charlie Rose, the Today show, Morning Joe, and The Colbert Report, among others. He’s happy to talk a defense policy and politics. “It’s not complicated. If you want more of it, you reward it. If you want less of it, you penalize it,” he told me of ISIS. He even caused a stir talking about the now-infamous intelligence that led to the Iraq War with Colbert. “If it were a fact, it wouldn’t be called intelligence,” Rumsfeld quipped. But mostly, he wants to talk games. Would he ever make another one? “I don’t know,” he said, while admitting that the name Gin Rummy suggests itself.